Sir Gore Ouseley was in 1811 the first British resident ambassador to be appointed to Persia. He took with him to Tehran the Foreign Office’s authority to obtain a grant of land from the Shah and to spend £8,000 on building and furnishing an embassy house. The Shah duly stripped one of his generals of his land and presented it to Ouseley. It lay just south of the main bazaar and became known as the Bāgh-I Īlchī, Garden of the Ambassador. The area is still sometimes called that today. The scholarly Ouseley was his own architect: his previous experience, ten years earlier as a major serving in India, was designing for the Wazir of Oudh the Dilkushā palace at Lucknow, modelling it on Vanbrugh’s Seaton Delaval in Northumberland. The site in Tehran was awkwardly shaped, hemmed in by mud houses and bisected by a public street but Ouseley managed, with simplicity and elegance, to lay out an axis that controlled the siting of his tall single-storey house, and a number of ancillary buildings, courts and gardens. 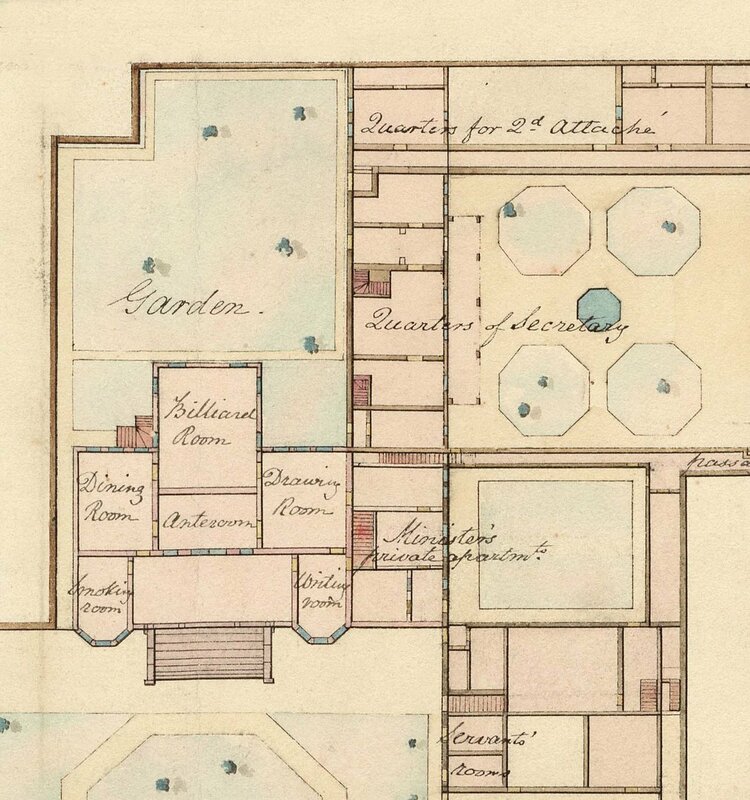 The house itself was approached through an entrance building, across a rectangular grassed court, and up a wide, shallow flight of steps on to a terrace with a classical portico supported by four slim columns. It was clearly designed to project the authority of His Majesty’s ambassador. Its strong appearance and formal plan arrangement contrasted sharply with the muddle and mud of the surrounding native area. Over time, some of the huddles of adjacent buildings were bought direct from their owners and converted for chancery and consulate, quarters for attachés, and stabling. Ouseley and his staff moved into the completed embassy house in December 1813. It was the first house that any foreign mission had been allowed to build in Persia and it drew admiring remarks from the outset. James Morier, the secretary of embassy, wrote four days after moving in ‘The house, with its white columns and its clean, tall facade glitters more brightly than any other building in Tehran … it stands out among the mud houses of rascals and fishwives which surround it’. Ouseley described the impact of his entertaining style on his first Persian ministerial guests ‘my display of chandeliers and lustres with spermaceti candles, and my fine plate quite astonished them – but a good English grate and a rousing fire seemed to claim almost equal admiration’. Ouseley left Tehran in 1814: none of his successors until 1944 carried his ambassadorial rank. The house deteriorated quickly in the hot and harsh conditions and was further damaged in the earthquake of 1830, after which ministers used it as little as they could. In 1860, control of the legation passed from the India Office to the Foreign Office and the diplomat Charles Alison, after long service in Constantinople, arrived as minister in that year. His first accommodation challenge in Tehran was to build permanent summer quarters for the legation at Gulhak. That done by 1865, he turned his attention to improving the deplorable conditions to which Ouseley’s Bāgh-I Īlchī house had by then sunk. He commissioned advice from a Monsieur Bovagnet, a resident French civil engineer, whose report was forthright: ‘The neighbouring streets are narrow, abound in wells and holes, and have generally an open sewer in their centre. The nearest gate, being the only one by which caravans are allowed to enter the town, is constantly choked with camels, mules and apes. It is therefore almost impossible to reach the Mission door in a carriage.’ And his recommendation was firm: the legation should move. That move was achieved in 1872, enabling the old Bāgh-I Īlchī premises to be disposed of at last. Parliament had been told in 1869 that their sale would fetch about £12,000 but this proved wildly optimistic. 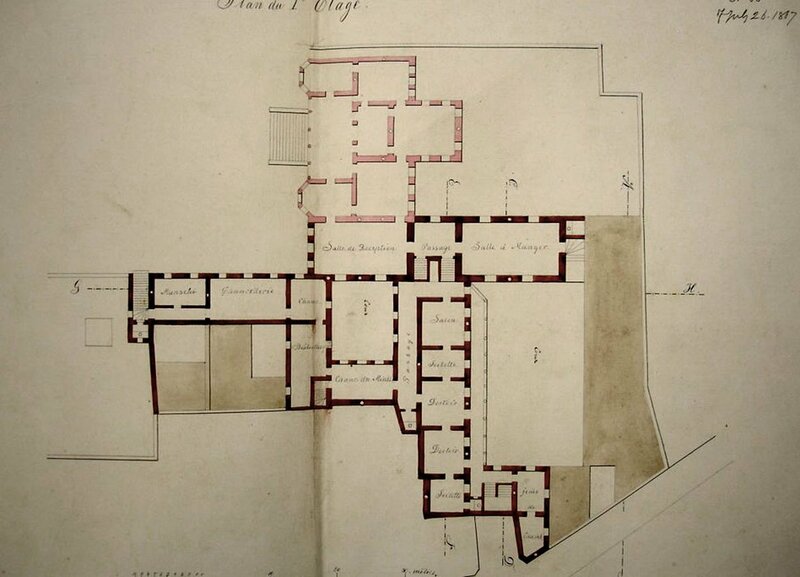 Although the lesser properties at Bāgh-I Īlchī were bought by the British government from their owners and could therefore be sold, the land on which the main building stood had been forcibly taken from its owner by the Shah in 1811, and could not therefore responsibly be sold. By 1873, the British government offered to sell what it owned and to cede to the Persian government what had been confiscated in return for more water rights in Tehran and Gulhak. This offer was refused and the old Bāgh-I Īlchī premises were instead leased out until 1882, when a new formula was agreed by which the descendant of the family dispossessed in 1811 would issue a disclaimer for the confiscated land in exchange for being given the old oriental secretary’s house, which the British government had built on land that it had bought. The disclaimer enabled the rest of the premises to be sold for 10,000 tomans (about £3,750). 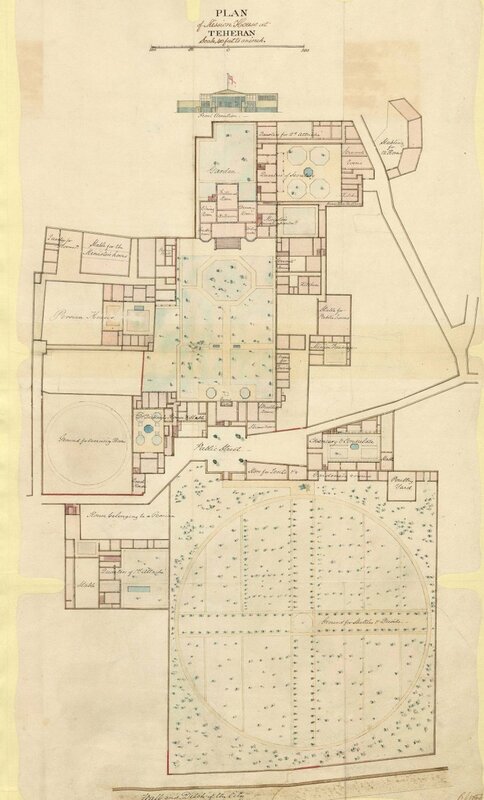 Site plan of first mission buildings, surveyed by M. Bovagnet, 1860. Sketch of entrance to residence, enlarged from Bovagnet’s 1860 survey drawing. 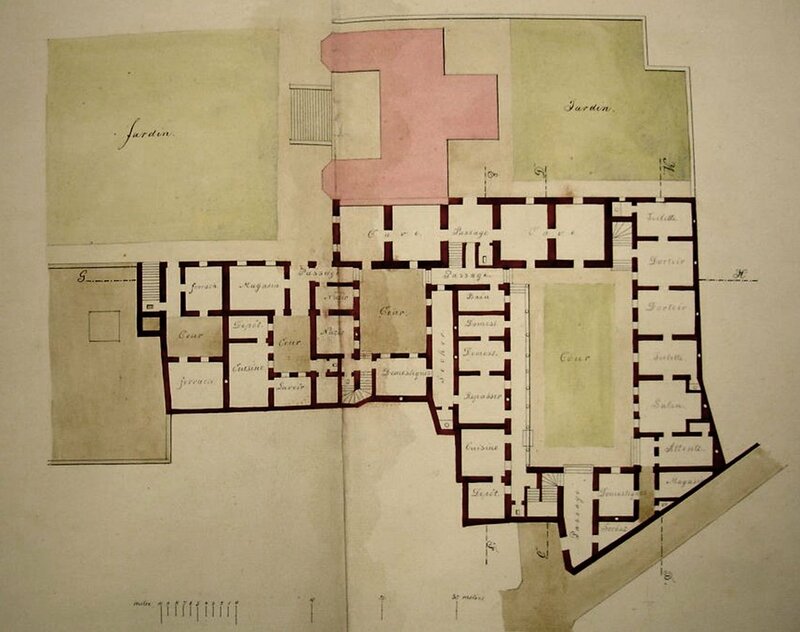 Enlarged plan of the residence to show layout of fomal rooms. Residence layout in 1867, with reception and dining rooms more directly accessible from the other formal rooms. The formal rooms of the residence were all at first floor level: here are the ancillary ground floor rooms.